Every year, scientific investigations yield more and more evidence that dogs are up to some pretty surprising challenges, in ways that are proving quite beneficial for people. We’ve all seen police dogs skilled in the detection of bombs and contraband. Now researchers are applying that same olfactory prowess to snuffling out all manner of scents, from deadly food allergens to costly insect infestations. For example, trainers at the Florida Canine Academy provide dogs with instruction on how to detect the trace presence of peanuts. Just ask anyone with a severe peanut allergy … just one nut can prove lethal. Alternately, traditional bedbug detection methods can be very time-consuming and labor-intensive. A canine trained to sniff out bedbugs can search the average hotel room in less than two minutes! Dogs have also been trained to detect seizures. Much like the job of a seeing-eye dog, seizure dogs help their pet parents navigate day-to-day activities, protecting them from known triggers and potentially harmful situations. These canines excel at recognizing subtle body changes during these traumatic neurological events. Some pups are so sensitive, they can predict an oncoming attack early enough to allow their human to get to a safe place and take medication to reduce the seizure’s severity. Researchers have documented numerous instances of dogs with the ability to detect cancerous tumors. According to an article in The Lancet, a patient reported that her dog would repeatedly investigate a mole on her leg. At one point, the pup even attempted to bite off the suspicious beauty mark! A medical exam proved what the dog already knew … it was a malignant melanoma. Had it not been for her dog’s nosy behavior, the deadly cancer might have remained undetected. In a 2011 study, Japanese researchers reported that an eight-year-old black Labrador proved exceptionally accurate at nosing out the presence of colon cancer. When doctors provided the pup with samples collected from 185 patients, the retriever positively identified those suffering from the disease with a success rate that was nothing short of astonishing … 97%! Last but certainly not least, canines are proving adept at detecting low-blood-sugar levels. In 2000, The British Medical Journal reported that more than a third of dogs living with a diabetic human exhibited behavioral changes when their pet parent’s blood sugar dropped. Some reacted before the person was even aware of any symptoms. The paper also cited two cases where the dogs not only detected the low blood sugar, but they encouraged their people to eat! Researchers are hopeful that this natural knack can be taught, which could make a huge difference in the ongoing care of millions of diabetes sufferers. In light of all the evidence, there’s no doubt … our beloved best friends really are leading the pack towards improving our lives! 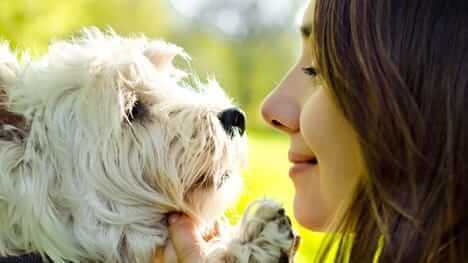 Great article bringing more awareness of how much companion animals enrich our lives! Here is a great example of a Diabetic Alert Dog who is doing exactly what you mentioned in your column, sniffing out changes in blood sugar levels. The dog is Clover, who I am proud to have bred, and her little boy is River who has Type 1 Diabetes. River's mother keeps an active facebook page with frequent updates about Clover's work. Great article on how dogs can assist humans in so many ways! I saw a documentary last year about dogs detecting seizures and cancer; people are still surprised when I tell them about it. Thanks for informing people! I just sent my second goldendoodle puppy off to be trained as a Diabetic Alert Dog. I could not be more proud of him for being selected to do this important work. Great article. Dogs are amazing. They continue to amaze us. Thank you for the information and insight. Thank you Dr. Jane for this amazing article. Such good information about how wonderful our pets really are. Great info on the videos. Dr. Jane is amazing!! !